The effects of secondhand smoke on people are well-documented. Exposure to tobacco smoke causes a variety of serious health problems, including stroke, heart disease, and lung cancer, according to the Centers for Disease Control and Prevention. Not surprisingly, secondhand smoke also increases the risk of health problems for your pet. Breathing in tobacco smoke can increase the chance that your dog will develop lung or nasal cancers. Nasal cancer is more common in long-nosed dogs, including collies, greyhounds, Afghan hounds, dachshunds, and borzois. Because more carcinogens can accumulate in their long noses, fewer carcinogens reach their lungs. In contrast, shorter-nosed dogs that live with smokers are more likely to develop lung cancer because their noses do not filter the carcinogens as effectively. Unfortunately, the long-term survival rate for nasal cancer is low. Dogs that receive radiation treatment, the recommended treatment for nasal cancer, usually live an average eight to 19 months, according to the National Canine Cancer Foundation. Exposure to smoke also increases the risk that your dog will develop asthma, bronchitis, or other respiratory problems. If you have ever been in the home of a long-time smoker, you may have noticed that the walls were coated with a yellow, sticky residue from the tobacco smoke. Unfortunately, carcinogens do not just coat the walls, but also fall on your pets' fur. Since cats clean their fur by licking it, they are more likely to develop squamous cell carcinoma in their mouths. The risk of developing the cancer increases if cats have lived in the environment for five years or longer. Cats exposed to secondhand smoke are also 2 1/2 times more likely to develop malignant lymphoma than cats that live in smoke-free homes. Dogs and cats aren't the only pets that experience health problems when they live with tobacco smoke. Birds are particularly sensitive to smoke, chemicals, and other pollutants. When they are exposed to secondhand smoke, they are more likely to develop pneumonia, lung cancer, heart problems, skin and eye irritation, coughing, and sinusitis. Your cat is unlikely to think an ashtray full of cigarette butts looks tasty, but your dog might decide that they make a good snack. Eating butts can lead to nicotine poisoning, a condition that can cause death if your pet ingests enough nicotine. Your pet can also develop nicotine poisoning if it drinks water that contains cigarette or cigar butts, or eats nicotine gum or patches. The best way to prevent these serious health problems is to quit smoking and maintain a smoke-free environment for your pet. Although confining smoking to an outdoor area can help, your pet will be still be exposed to nicotine and carcinogens on your clothing, hair, and body. Vaping is touted as a better solution to smoking, but the e-cigarettes still produce chemicals that can be toxic. Obesity is just as dangerous for pets as it is for people. The Association for Pet Obesity Prevention estimates that 52.7 percent of dogs and 57.9 percent of cats are overweight or obese. Obesity can cause a variety of health problems, including diabetes, heart disease, high blood pressure, respiratory disease, kidney disease, and cancer. Make sure you do not overfeed your pet, and consult your veterinarian if you notice that your furry friend is packing on the pounds. Exercise is an excellent way to maintain your pet's heart and respiratory health, and keep bones and muscles strong. Give your dog plenty of opportunity to run and play outdoors. Daily walks or runs and vigorous session of fetch will help ensure that your pooch gets enough exercise. Encourage your indoor cat to be active by enticing him or her with a kitty fishing rod or operating a remote-controlled mouse. Some cats even enjoy outdoor walks on harnesses. During your pet's yearly exam, his or her veterinarian can diagnose health problems, such as diabetes or skin conditions, and prescribe treatments to prevent the problem from worsening. 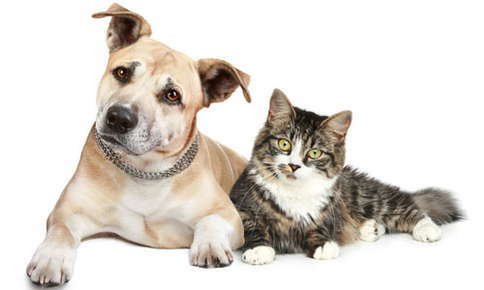 He or she can also provide advice on maintaining a healthy weight and keeping older animals healthy and comfortable. We are here to help your pet stay strong and healthy. Give us a call if it's time for your pet's annual exam, or if you are concerned about a possible health problem.